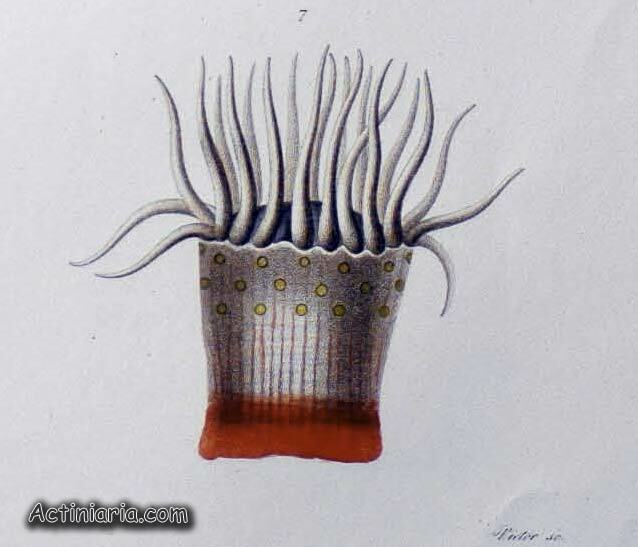 Original figure of Macrodactyla doreensis (originally named as Actinia doreensis) published by Quoy and Gaimard in 1833. 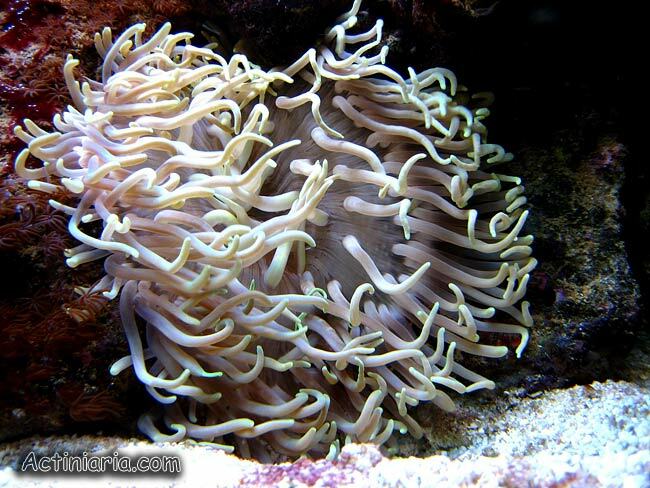 Large tropical anemone widely known as Macrodactyla doreensis is quite common in aquarium trade and is well known for many reef keepers. I never had chance to keep it in my reef tank and never had chance to examine any preserved specimens referable to this species, so I"m not quite familiar with it. Actually, I"m even not sure if the photos presented here show the same species. The first photo shows a specimen with a very characteristic appearance, it has about 96 tentacles and characteristic white lines on the disk and tentacles. Similarly looking specimen is identified as Macrodactyla doreensis in the paper of Fautin, Crowther and Wallance (2008, Sea anemones (Cnidaria: Anthozoa: Actiniaria) of Moreton Bay). In the definition of the genus Macrodactyla these authors say it has only 48 tentacles, but the photos they give on the same page show many more. The second photo shows a differently looking specimen with many more tentacles, and not so distinct white lines. Numerous similarly looking photos, identified as Macrodactyla doreensis can be found in the Internet and also in scientific papers (e.g. 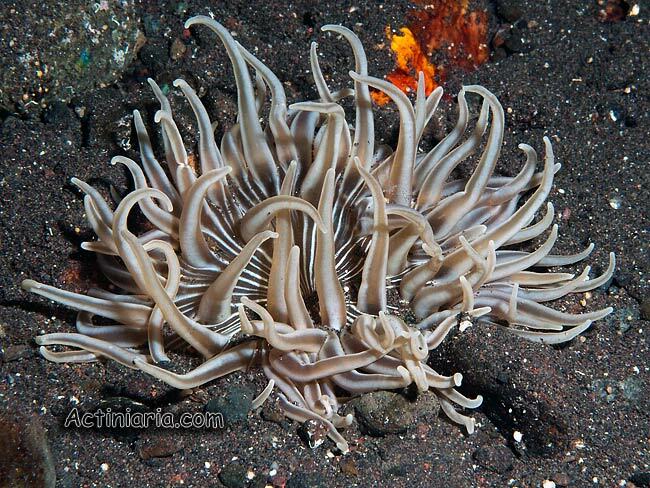 Fautin, Tan, Tan, 2009 - Sea Anemones (Cnidaria: Actiniaria) of Singapore). Is it the same species as on the first photo? I do not know, but most probably not. Originally Macrodactyla doreensis was described (as Actinia doreensis) by Quoy and Gaimard in their famous book published in 1833. The description they gave is short, but it states that the tentacles are not numerous and the figure they published (reproduced on the bottom of this webpage) shows only 21 tentacles. Of course this very old figure is too schematic. But can we say it shows the species currently known as Macrodactyla doreensis? Not sure, but most probably not. The generic name Macrodactyla Haddon, 1898 (sea anemone) is preoccupied by the generic name Macrodactyla Harris in Hitchcock, 1833 (Coeloptera - beetles). 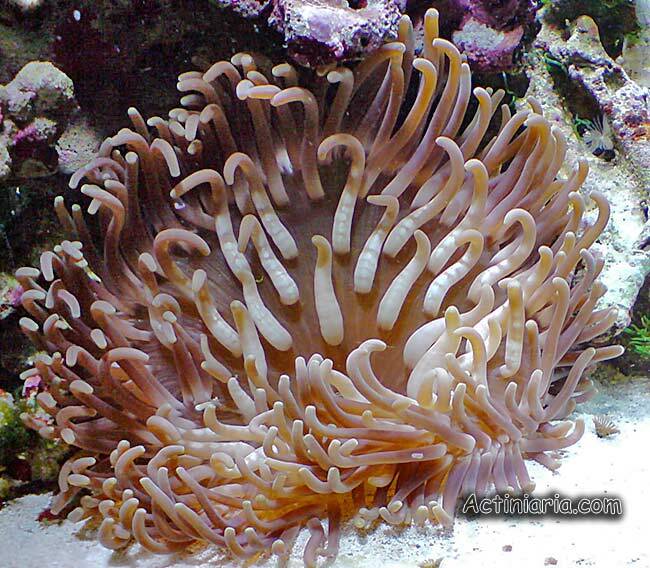 In other words, generic name Macrodactyla cannot be used as a valid name for sea anemone because it was used earlier for a beetle and must be replaced by a new name. Although this fact was probably first discovered and reported by Fautin et al in 2007 in a catalog of all genera of sea anemones, she continued to use Macrodactyla as a valid name in her papers (e.g. Fautin, Crowther, Wallace, 2008; Fautin, Tan, Tan, 2009). 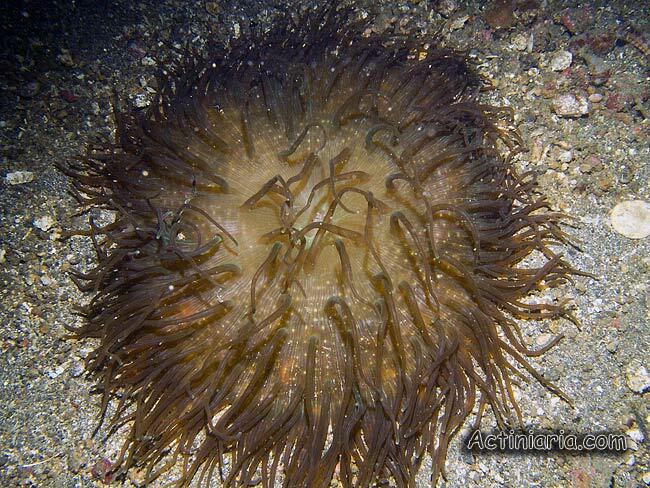 In 2016 Fautin resolved this situation by simply stating that all existing Macrodactyla species are "returned" to the genus Condylactis, so valid name for discussed here anemone, according to Fautin (2016), should be Condylactis doreensis. Fautin (2016), however, failed to provide any discussion and explain why she decided to move former Macrodactyla species to Condylactis, other taxonomosts may have their own opinion.